Columbia Police Chief W. H. “Skip” Holbrook announces the arrest of a female in connection with yesterday’s hit and run collision at North Main and Fairfield Road that sent a teen to the hospital. 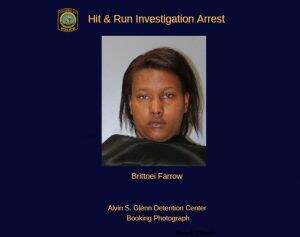 Brittnei Farrow (DOB: 4-28-1994) is charged with Hit and Run with Injuries, Failure to Give Information and Render Aid, Operating an Uninsured Vehicle, and Operating a Vehicle without a License. Farrow is currently detained at the Alvin S. Glenn Detention Center. Case Synopsis: Initial information from the Traffic Safety Unit (TSU) indicates that on Tuesday, March 26, 2019, Farrow was traveling southbound on North Main Street and stopped at a red light. At the same time, a 14-year-old male on a bicycle was traveling westbound (across North Main and Fairfield Road) in a crosswalk. When the traffic signal turned green, the teen and driver advanced and collided. It is believed that the teen accidentally rode into the driver’s side of the vehicle. The suspect driver, Farrow left the scene and didn’t stop to help the teen. The teen was taken to the hospital for his non-life threatening injuries.